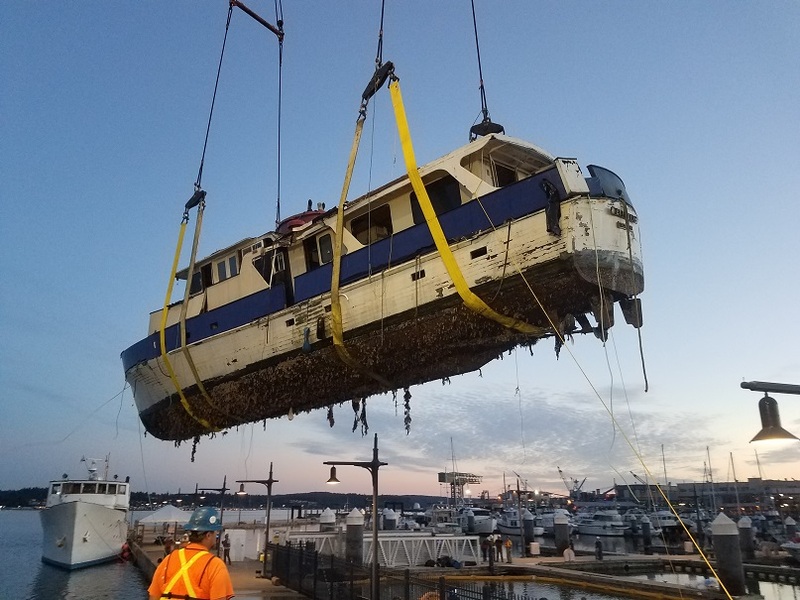 M/V Eventide Vessel Removal & Demolition - Global Diving & Salvage, Inc. 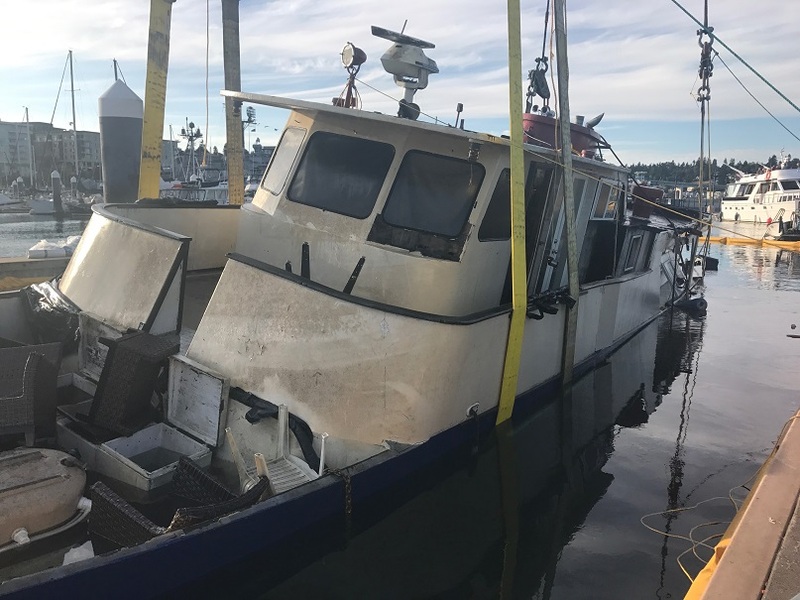 The 83’ recreational vessel M/V Eventide, a former US Coast Guard cutter, sank while moored at the marina breakwater in Bremerton, WA. 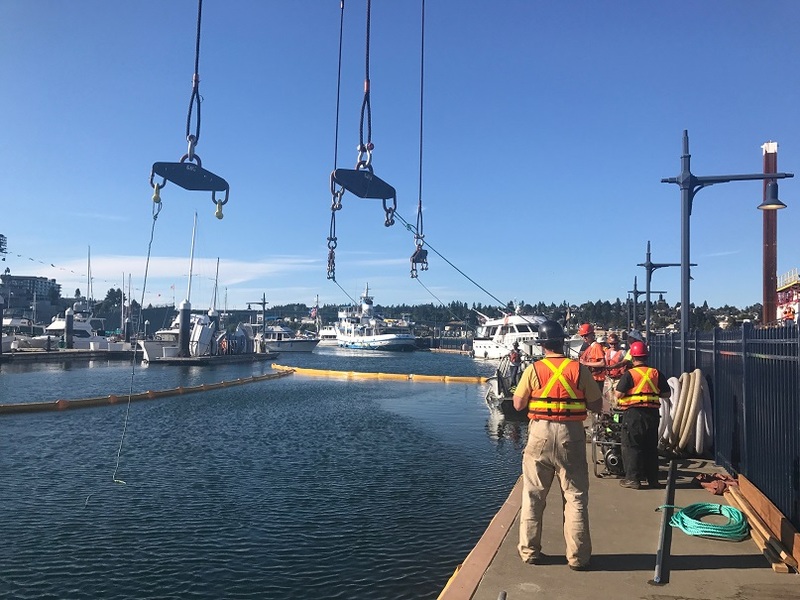 Marina personnel placed containment boom and absorbents around the sunken vessel, and Global was contacted to perform defueling operations. Divers searched for leaking pollution and sealed underwater vents, but the vessel was initially too lively to allow safe defueling and operations were halted. 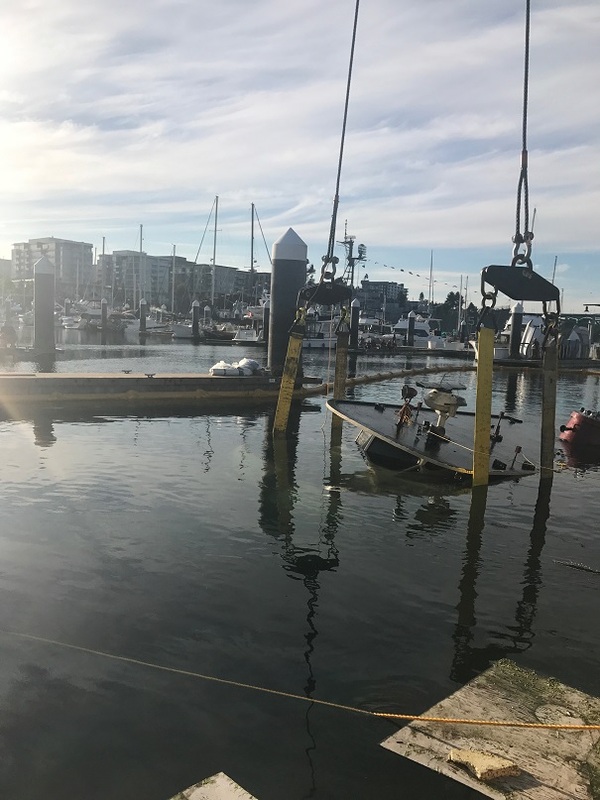 After the stern of the vessel settled to the bottom of the marina in approximately 60 fsw, divers were able to remove 1,500 gallons of mixed fuel and water from two tanks (totaling 179 gallons of fuel after being separated). The Eventide had been modified significantly from its original ship drawings, so Global’s naval architect was consulted to provide accurate weight and force measurements for lifting. A derrick barge and a deck barge with sealed bin walls were mobilized and positioned adjacent to the Eventide on the other side of the breakwater. The vessel was rigged with 4 12-inch wide nylon straps run to spreader bars, then lifted to the surface with the crane. Once the decks were awash the vessel was dewatered and contaminates contained; the crane then lifted the Eventide over the breakwater and placed it onto the deck barge. 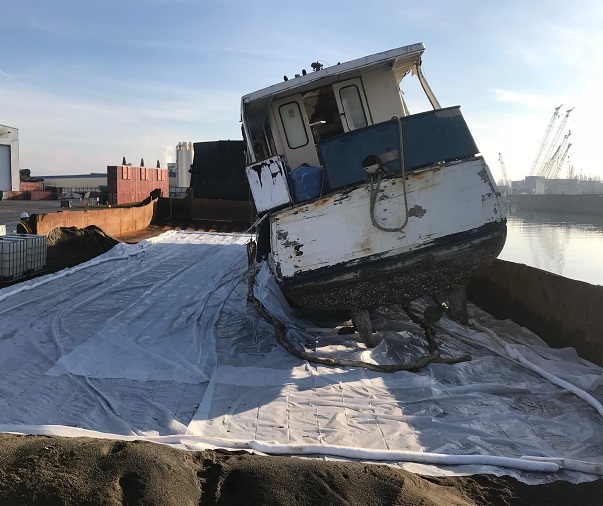 The vessel was surveyed for hazardous material abatement, and then held until approved was received for demolition and recycling. 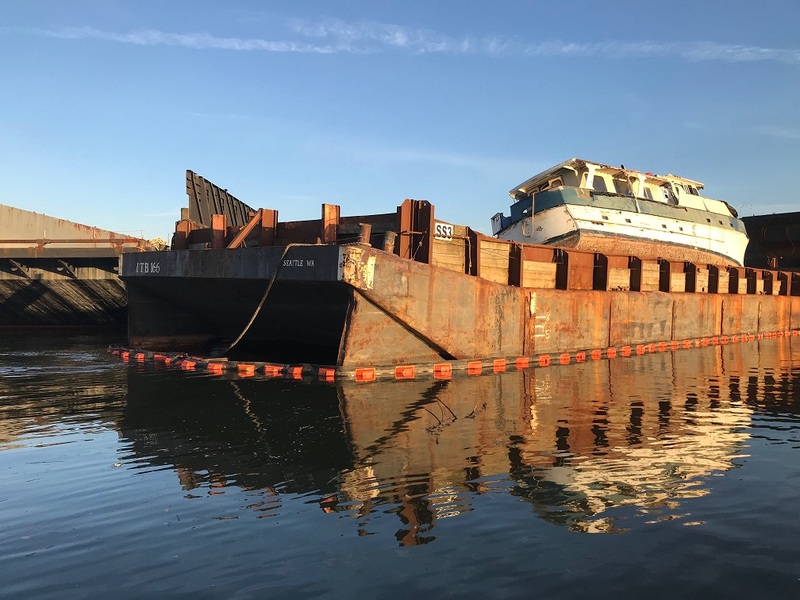 Demolition was performed on the deck barge; all contaminates and debris were contained and then properly disposed of or recycled. 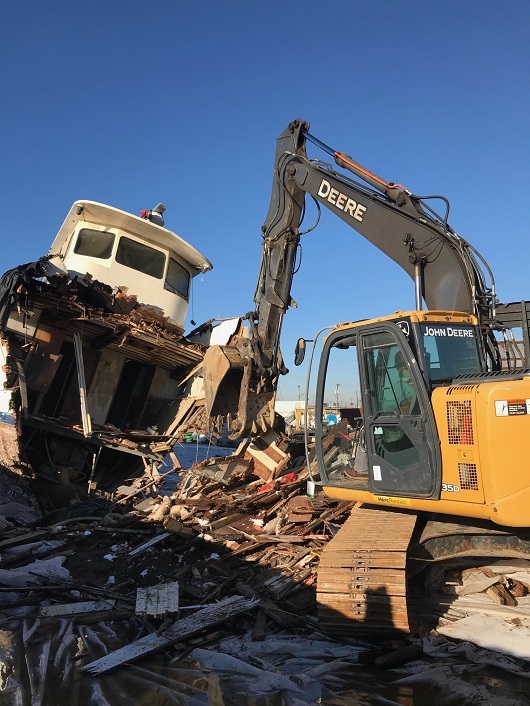 Over the course of the demolition, Global’s crews removed batteries, fire extinguishers, asbestos and PCBs, 1,300 gallons of oily waste water, 70 tons of debris, and 20 tons of material for recycling.